Summer Joy is Comin’ in! Summer is upon us now …..
We started summer in style with several joyous events that celebrated the culmination of spring’s frenetic growth! All in all, about 50 men, women & kids showed up to celebrate Summer Solstice and 4th of July week-end drumming and foolishness with us. You can read more about these events and see photos on our flickr photo pages. 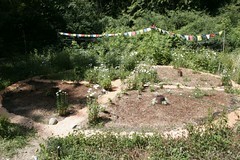 Things are settling now into the ‘lazy days of summer.’ Our new Medicine Wheel garden (begun at Spring Equinox) is looking beautiful and groomed again thanks to the efforts of Groves’mates Larissa Notter, Sarah Jackson and Sage Vann. 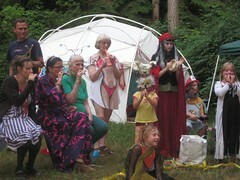 If you were here at Spring Equinox, check out the photos to see how it has evolved! Better yet: DO come visit sometime this summer! In addition to our regularly monthly offerings, we’ve got many special events this summer to draw you here. As usual, please RSVP! This entry was posted in News on July 16, 2009 by theresecharvet.